For a second day in a row, a cloud of smoke filled the air of Winnipeg’s downtown, but this time it wasn’t from a massive fire. 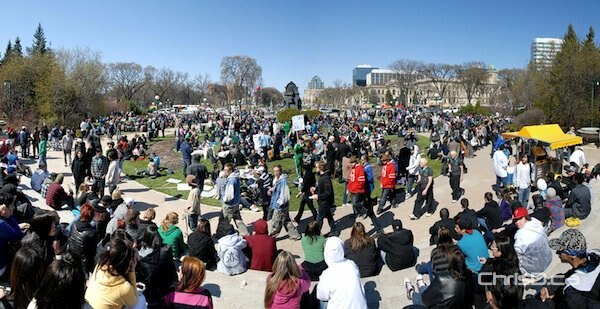 Pro-marijuana activists held their annual 4/20 demonstration on the grounds of the Manitoba legislature. 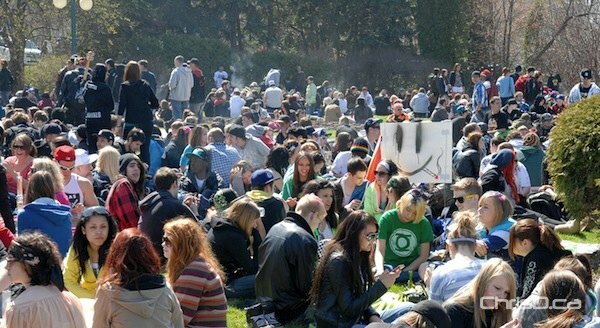 About 2,000 people were estimated to have been there, as smokers called on the government to legalize the drug. Police and provincial security kept watch, but did not make any arrests due to the numerous infractions playing out right in front of them. Their role was simply to keep the peace. Meanwhile, hot dog carts and other food vendors setup early Friday morning to prepare for what was a busy and lucrative day for them. The line late afternoon at many of the vendors was several dozen people deep. The demonstration coincided with a city-wide school in-service, so revellers estimate there were more people present this year than usual.